Last summer Sarasota County Director of Smart Growth Peter Katz created a buzz with a study showing that on a per-acre basis, downtown mixed-use development typically generates more than 30 times the tax revenue of shopping malls, busting the myth that cash-strapped municipalities ought to bend over backwards to attract mall development. 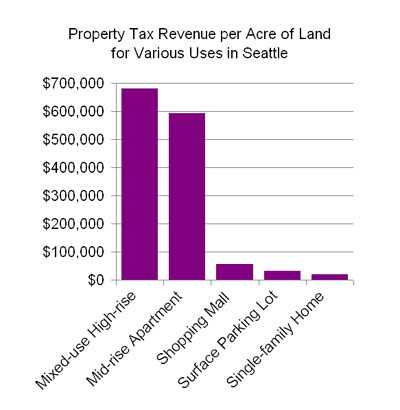 Recently the Downtown Seattle Association did some analogous number crunching on total property tax (including state, county, city, school district, etc) for a range of uses in Seattle, and the results are similarly dramatic, as shown in the chart below. Per acre of land used, the property tax revenue generated by the mixed-use high-rise (Harbor Steps) is more than ten times that of the shopping mall (University Village), and about 20 times that of a surface parking lot (4th and Washington). The mid-rise apartment (Pickering Place) generates about 10 percent less than the high-rise, while the the single family home (Northeast Seattle) generates the least of all. There’s a “well, duh!” side to these results, given that property tax is generally based on assessed value. But these gaping differences need to be understood in terms of how they impact choices we make regarding how the city is developed. First, the data should help dispel the impression some seem to have that high-density mixed-use projects are freeloaders. But more importantly, given the well documented environmental benefits of high-density urban infill development in cities like Seattle, the existing property tax structure is tipping the economic scales in a way that thwarts the kind of development we want. 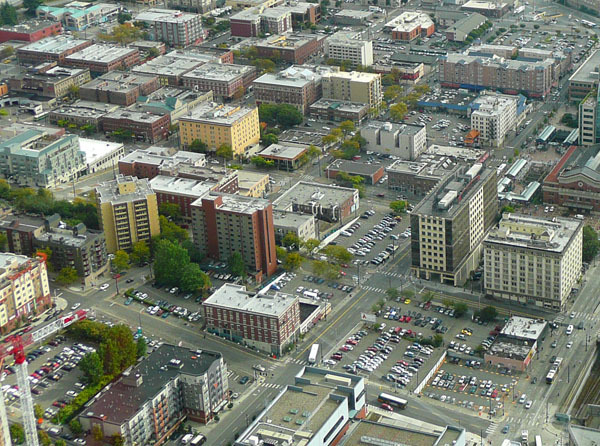 The case of a downtown surface parking lot is a particularly egregious example, because the relatively low tax rate encourages owners to sit on underutilized land, impeding its conversion to more beneficial uses. You tax what you want less of. In effect, an LVT would work a lot like a tax on low-density development, justifiable as compensation for the externalized environmental costs associated with typical low-density lifestyles. Based on that rationale, former Vancouver, BC mayor Sam Sullivan has recently been advocating for a tax system that would shift the property tax burden from high- to low-density neighbhorhoods. Of course, no matter how smart and sensible such a tax shift may be, because of the massive shake up to the status quo it would cause, it is not likely to be taken very seriously in most political circles. Because, you know, everything’s just fine and dandy as it is, no need to rock the boat, I mean, it’s not like we’re facing the most dire environmental and resource crises in the history of humanity or anything like that… ahem. Yes yes yes! Ever since I read about the land value tax years ago I have been constantly baffled as to why cities won’t give it a try. It makes so much sense and would truly transform our cities and suburbs. Why do we want to punish people for creating a lot of value on a small amount of land? Why do we encourage slumlords to hold onto decaying properties for as long as possible? If anyone has any ideas for getting this implemented I would love to hear it. Would it take a constitutional amendment? A ballot initiative? Could a city go ahead and try it on its own? It seems the reason we in Washington overbuild commercial centers in the suburbs is because of the way we apportion sales tax revenue. If you’re a small municipality in WA, you can capture your neighbors sales tax revenue by building a regional mall. Obviously a small town in the suburbs won’t have demand for high density housing and office, so retail is the only option, and sprawling retail is the cheapest way to build it. A switch would be a major shake-up of the status quo, but I’m not entirely sure it would be as bad as many property owners might fear. Would it have a tremendously huge effect on existing “high” use/improvements? Midrise and highrise (high value) improvements are typically built on high value land (downtown, near transit, etc). It would have to be structured and advocated for in a way that got these existing high use property owners on board (or at least indifferent), so that the greatest effects could be brought to bear on those who are sitting on valuable land with poor uses (downtown parking lots, etc). If the needle could be threaded just right, it could also be structured not to have tremendous effects on the vast majority of single family housing owners… and leave a lot of folks unaffected and really hone in on discouraging the worst abuses of underutilization of land. But that could be a very hard needle to thread. This is all probably too wonky for uninterested voters to ever understand or care about unless it’s sold purely as “lower! property! taxes! for! you!” Maybe it’d be better to get the DSA, et al to lobby city council for a gradual transition. However we do this it should be gradual. That needle’s hole becomes smaller the more quickly you implement this. If you miss and increase a home’s taxes by, say, 20% it’s a lot more painful to increase that all at once than, say, 2% per year for a decade. First off, as an economist, I LOVE the land tax idea. One of the pervasive problems with virtually every tax regime is something called “excess burden”. The concept is that whenever you tax something, people shift their production/consumption decisions in order to avoid the tax. This results in resources being used inefficiently and creates a “dead weight loss” in the economy. A dead weight loss is equivalent to burning money. The money is simply wasted and no one benefits. All tax systems create some degree of excess burden, but not all tax systems are equal in this regard. There is a whole field of research centered around making tax systems more efficient. Anyway, long story short, taxing land is the most efficient tax regime possible. Why? Because land is a “fixed factor”, nobody is making more of it and we can’t get rid of any of it either. I could prove this mathematically, but it would involve lots of calculus. However, as wonderful as land taxes are, there is at least one very significant drawback: equity. Here’s your problem: take two houses on Queen Anne hill built next door to each other, each on a 5000 sf lot. One of these houses is a 4,000 sf mansion with top quality architecture, and luxury finishings. This house was built recently and is occupied by a Microsoft millionaire. The other is a 1,200 sf bungalow built near the turn of the century for a working class family, which has been passed down for 4 generations and is now occupied by a retired couple on a fixed income. Now, under the current tax regime, the value of the mansion is 4 to 5 times the value of the bungalow and thus the owner’s property tax bill is 4 to 5 times that of the retired couple in the bungalow. However, the value land underneath each of these houses is the same, and thus under a pure land tax, the property tax bills would be the same for these two properties. Even if you phase it in slowly, shifting from an improvements tax to a land tax will result in lower tax bills for the wealthy and higher tax bills for the poor. This same issue applies in multifamily housing. Take a standard low-cost stick-frame apartment building compared to a luxury condo development of the same density in the same neighborhood. Again, the tax bill for the low-income housing will go up while the tax bill for the luxury condos would go down. Same with office development: lower tax bills for downtown highrises and higher tax bills for old historic buildings in Pioneer Square. Part of what is good about land taxes is that they discourage land speculation and encourage development. That’s great when you are talking about parking lots and strip malls, but not so great when you are concerned about historic preservation and gentrification. Notice that these are not selfish, private interests pitted against the public good. These are real public interests that matter a lot to a lot of people. Can a land tax regime be developed in a way that allows us to capture the benefits of such a tax (greater efficiency, punishing land speculation, greater density) without these deal-breaking equity impacts? Well, yes and no. One possibility is a hybrid tax in which land and improvements are assessed and taxed separately with land taxed at a higher rate. Philadelphia does this for example. Another tool that could be used is a progressive property tax, which basically taxes land at a flat rate but improvements are taxed at a higher rate based on the per unit value of the housing. Per unit is the key. A midrise apartment building is more valuable than a mansion, but not on a per unit basis. Tax exemptions for historic structures and affordable housing can help mitigate the incentive that land taxes create to demolish these structures. Unfortunately, any move away from a pure land tax creates new distortions and inefficiencies and thus undermines some of the motivation for making the switch in the first place. The key is to find a balance between the competing goals of efficiency and density that militate for a land tax and the goals of equity and preservation that militate against it. On this issue, there are no easy answers. Any shift in tax regime will require careful thought and consideration of all of the direct and indirect consequences. It won’t be easy, but the potential benefits of a shift toward land taxes make it is a conversation worth having. One quick note: notice how close the values of midrise and highrise are. Given that midrise is less expensive to build, meets with much less neighborhood opposition, and requires less energy per square foot both to build and operate, it should be clear that the real ball game is moving from lowrise to midrise. Trying to move from midrise to highrise is a much tougher sell for a much smaller marginal benefit. Certainly highrise makes sense in downtown and a few other places, but the battle for density, efficiency and sustainability is going to be won or lost on the debate between lowrise and midrise. The New Pioneer Square – Help Give Pioneer Square and Chinatown/ID a Boost!